So one of my coworkers, Kari, came to me in dire need of help. Yes, she sought me out in all of my wise wisdom for answers. She was looking for a winter hobby that would get her out of the house and help her to be more social. Being the unsocial hermitis workaholic bookworm that I am, I had to Google it. AND yes this came from a manly hobbies website. All the woman's hobbies were sewing and making a quilt, not what I was looking for exactly. I also suggested archery and whittling from this site, but she wasn't too keen on weapons use as she would end up hurting herself and others. This might not sound exactly like a hobby, but it sure is a lifestyle choice. Dabbling in certain lifestyles can be hobbies and interests for adults, so I'm sticking with this! pare down your wardrobe (this is a pretty popular one, make a goal like only 20 or 10 items). Here'sanother example. the 100 things challenge (pare your possessions down to 100 things). make as many things digital (and not physical) as possible, such as files, photos, cds and dvds etc. She wasn't too keen on this idea. From this site I also suggested street graffiti, joining the circus, or miming. But all she had to say was that she knew someone who joined the circus..."he was a real clown". So I continued on with my search. Kari mentioned that she likes puppies and dogs, so I thought she would appreciate this one. But she doesn't have the dedication or the dog to do it. This next one sounds really cool, but again with her lack of dedication she couldn't hack it. Who knew that Newsraiding would be such work? But then I found it!! The hobby that takes the cake! I have never heard of this hobby before and I feel like I have been incomplete up to this point in my life!! How did I go so long without knowing of this wonderful hobby? How does anyone go through life not knowing about this hobby?!?! My parents taught me nothing! I can't even...I just LOVE IT!! How?! Just how does one even come up with these amazing things? There is even and Extreme Ironing Bureau!! In the end, due to our lack of ironing skills (I may only own a mini ironing board which I never use, instead I just don't wear my clothes if they look too wrinkly), and Kari's lack of dedication, we settled on starting a book club where we may or may not read the book and get together to pretend to talk about it while we drink wine. 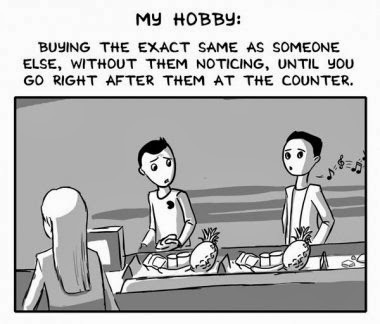 Sounds more like our type of hobby.